This butterfly bush (more pix here) is a group project from the polymer clay students at the Ohio Reformatory for Women for the Into the Forest exhibit. They created 27′ of big hole beads that were slipped onto brass rods and inserted into a wooden base made by my husband. The brass rods couldn’t be taken into the facility so we had to visualize the piece and assemble it at home. I’ll take the whole shebang apart to ship it off to Pittsburgh. Will you be part of this international exhibit? The deadline has been extended to May 1. You have plenty of time to make your mark on the fanciful forest that Laura Tabakman, Julie Eakes, Emily Squires Levine, Libby Mills and Nancy Travers concoct from your submissions. The event opens in Pittsburgh in November with a teaser preview on view at Synergy4 in August. 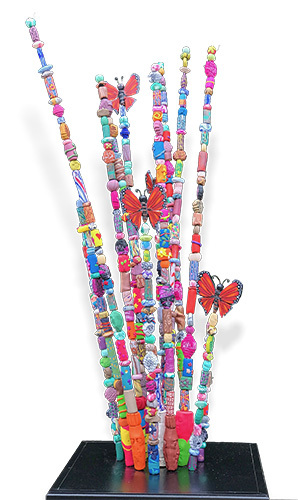 Are you tempted to make some beads to cheer up your own garden? Cynthia, these are wonderful! Thank you to the ORW artists and to you for creating such beauty for our forest. A small correction: the postmark deadline is May 2, 2017 since we know that many post offices worldwide are closed on May 1. Thank you for your work with women behind bars. They are a population who are misunderstood. Our country’s means of dealing with the incarcerated is heartbreaking. You are showing women how to change, to grow and be positive. You teach them to make something out of nothing, unlike the “justice system” which is choosing to punish. Thank you, thank you, thank you.